Jeffrey Jay Foxx and Walter F. Morris Jr. This acclaimed volume is the first to document the life of the Maya of today, a remarkable people who are the direct heirs to the magnificent Maya culture of Pre-Columbian times. Walter F. Morris, Jr., a highly respected expert in the field, and Jeffrey Jay Foxx, a well-known ethnographic photographer, capture the spirited story of this extraordinary people, who live in Central America and southern Mexico. 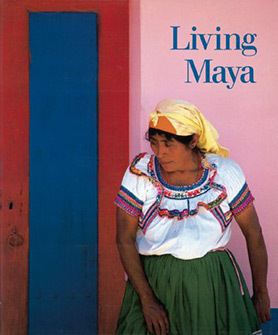 Living Maya reveals daily rituals, religious ceremonies, colorful markets, and stunning landscapes. Myths, legends, and songs are explained and depicted, and there is a special emphasis on the Maya’s weaving, the one art form to have persisted virtually unchanged throughout the last 2000 years. Walter F. Morris, Jr., has been studying and writing about Maya culture since 1972. He has curated several collections of Mayan art and has contributed to many publications and documentaries on the subject. He is fluent in several Mayan languages. In 1983 Morris’ work with the highland Maya, in particular his efforts in setting up the first Indian-run weavers’ cooperative in Mexico, was recognized by a five-year MacArthur Award Fellowship. He lives in Chiapas, Mexico. Jeffrey Jay Foxx has been documenting the life and arts of the Maya for more than two decades for such publications as LIFE and National Geographic. His work has been exhibited throughout the United States. Foxx is the photographer of two other Abrams books, The Turquoise Trail and The Maya Textile Tradition. He lives in Brooklyn, New York.